Teachers in rural China face major challenges in keeping students in the classroom with many teenagers now choosing to quit school to live as migrant workers. Although poverty used to be the main reason for dropping out, some teachers say children as young as 13 years old are abandoning their studies to chase their dreams of big money in the cities. 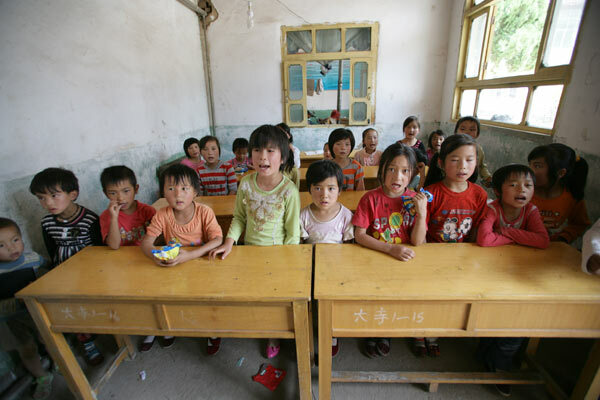 "Cases of children giving up education to be migrant workers can be found in any village in central and western parts of China today," said Wu Guobao, a senior researcher with the Chinese Academy of Social Sciences' rural development institute. At Wangji Elementary and Junior High School in Dongxiang county, Gansu province, principal Ma Jincheng estimated almost half of its 900 students will drop out after finishing junior high. "Many of these children will be migrant workers by the time they are 16 years old," he said. "They learn about the world outside (their village) through television, the Internet and relatives who work away from home. It's not easy to convince them to stay in school." Ma recalled one 15-year-old class monitor who quit school to live in Shanghai and then returned six months later to successfully persuade two classmates to join him there. "He told his friends that Shanghai has everything they wanted: jobs and money. So they left," he added. "It's not easy for a teenager to resist such a thing." Zhang Jijun, a 29-year-old teacher, said he has experienced similar problems at his school, Liudu Elementary and Junior High, which is in an impoverished village of Southwest China's Yunnan province. "My students all write about their city dreams in their essays," he said. "When I try to persuade them to finish junior high school, they argue that their illiterate parents can work in the city, so why can't they." Before the school moved into a newly built three-story building this year, Zhang said children used to study in a wooden shack that had a cowshed downstairs. "Now we have better facilities but fewer students," he added. "Many of them will go to the brickyards in Jiangxi province to carry bricks with their friends and family," said the 26-year-old, who regularly visits parents to convince them to keep children in school. "Some parents think they are helping their children by dispensing with, what they believe, is an unnecessary and expensive education," said Wu Yingzhen. "But they're actually ruining their lives." About 90 percent of migrant workers in her village returned from the cities after five to 10 years, she added. The struggling job market has also had a knock-on effect and, with fresh graduates being among the worst hit, experts suggest youngsters no longer feel that degrees guarantee an income. "Getting a (college) education doesn't look like such a good investment any more, which makes becoming a migrant worker more attractive," said rural researcher Wu Guobao. Figures released by the Ministry of Education show the number of students taking the gaokao, or national college entrance exam, fell for the second year in a row in 2010. Just 9.5 million took the test in June, 650,000 less than last year. Although officials put the decline down to a drop in the population's 18 to 22 age group, Li Chunling, a researcher with the Chinese Academy of Social Sciences' institute of sociology, believes a spike in junior and high school dropouts could also be to blame. "For urban people born between 1980 and 1985, the chance of them going to college is 5.5 times higher than their rural coeval," she wrote in a paper published in July by Sociological Study, one of the country's most important academic journals. For a growing number of teenage boys in the countryside, having considerable sums of money and a decent marriage is the ultimate goal in life - and they see migrant labor, not college, as the best way to achieve it. Gansu principal Ma Jincheng explained that, in his village, a man can spend up to 40,000 yuan ($5,900) on getting married - 20,000 yuan for the dowry and 20,000 for the wedding ceremony. After that, he needs from 100,000 yuan to 200,000 yuan to buy a house. "Farming can only bring in about 5,000 yuan a year," he said, "so they have no choice but to look for work in the city, where they can earn about 20,000 yuan." Although elementary and junior high schools have been free since the central government introduced its nine-year compulsory education policy in 1986, parents are still expected to pay out thousands of yuan to send their children to senior high school and college. Even if families can afford it, Ma said maybe only a quarter of rural students can compete with their urban counterparts in the gaokao and earn a coveted university spot. Zhou Shengli, who recorded the highest score on this year's national entrance exam in Dongxiang county, will in September continue his studies at the prestigious Nankai University in Tianjin. Yet, despite being assured a place, the 20-year-old is worried that the course fees of 12,000 yuan for the first year will be too much for his parents, whose combined annual income is just 5,000 yuan. He said he has already applied for a 6,000-yuan bank loan and plans to borrow the rest from his relatives. Out of the 45 students in Zhou's class at junior high, only eight went on to graduate from high school. He is also the only one to secure a college place. Most others quit to join China's army of migrant workers. 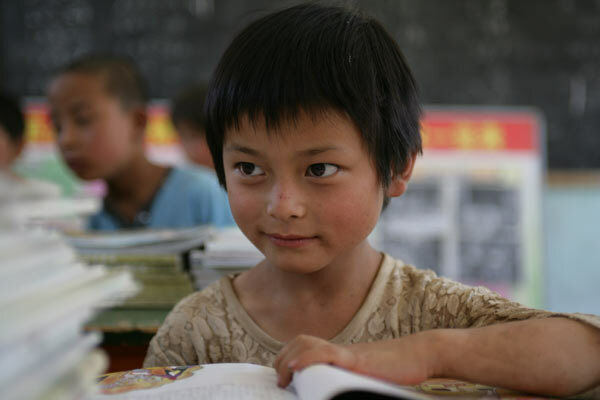 The free, compulsory education policy has had a massive impact in rural China, particularly in helping to reduce illiteracy rates. In Dongxiang, which has a total population of 279,600, more than 97 percent of children aged 7 or older are enrolled in elementary school, with about 91 percent of them staying in education until the end of junior high, according to statistics from the county authority. "Compulsory education has basically wiped out illiteracy among the young and adults," said Shang Xuehua, deputy director of Dongxiang's education department. "Most villagers support their children in finishing junior high school as it is totally free and the children need basic reading and writing skills," he explained. "In remote areas, though, only 50 percent of students finish high school, with (even fewer) going to college." Shang said his government is focusing on increasing the number of primary and junior high school students who go on to receive further education, and cited the fact that 190 young people from Dongxiang enrolled in universities last year - tenfold the number in 2000. "For those rural children who don't have the chance to go to college, the government should provide them with a cheap and convenient vocational education," said Yuan Guilin, a professor of rural education at Beijing Normal University. He said cheap, one-year vocational courses would be a suitable alternative for school dropouts. "If they have to work after junior high, at least they should receive vocational training that could enable them to find a better job than carrying bricks," he said. "At the moment, most dropouts are dropped into society without any chance of becoming competent (in anything)." Experts also recommend that schools welcome back former students looking to return to education after working as migrant laborers, no matter their age. Liu Yunbin, deputy principal of Suonan Minzu Elementary School in Dongxiang county, has been doing exactly that for 29 years - resulting in almost 10 percent of the school's 880 pupils being "over-age". Some are up to four years older than their classmates, with the eldest being a 16-year-old in sixth grade, he said. "They dropped out to work and came back after one or two years. Most of them regretted missing out on their education and we always kept our doors open to them. "Most of the dropouts will have earned several thousand yuan but they come back eventually and live rural life like their parents," he added. "Giving up education only pushes them away from urban life, not closer."